I wrote a whole, funny (well, I thought so) piece in honor of my Long Run over the weekend, but my computer kindly deleted it. So after pushing undo, undo, undo on frantic repeat, I thought I would just start anew with run on sentences and a mix match of misspelled words. You hate it, you love it, you gotta do 'em. If you're training for an endurance race, you know exactly what I'm talking about. For me they are written in permanent ink on my calendar. My palms sweat, my blood runs cold, and I get oddly thirsty in anticipation of this weekly nemesis that humbles me, takes up a lot of time, and leaves me weak. At one point or another, you just have to embrace it. I say this all in jest because I actually love the long run. I love the fight of it all. From mile 1, 3, 9, 12, 19 or whatever number where that wall hits and you don't think you can put one leg in front of another any longer, you fight. You fight to keep the sweat out of your eyes, to not get bored by the music, and all the internal demons that are calling your name. Believe me, the long run and I know about the demons. I must credit these hours on hours long solo sessions with some of my biggest self help/healing/hating/motivating/cleansing decisions. I've fought with myself over what the right thing to do in situation X would be or how to approach person Y and be more compassionate/strong/independent/kind/fill-in-the-blank. I've stood up for what I felt was right and really gotten down in the dumps with myself when on these pounding-the-pavement internal therapy sessions, I realize that it was me who did the wrong thing. I love that the long run weakens you. At the beginning you start feeling strong, but mile by mile the distance breaks you. For me it is always my right toes that swell first. They grow and swell and people would probably guess I was a troll if you only saw my feet. Soon after my left calf (endlessly weak) starts to tighten and my shoulders feel heavy. I feel my stance slump and look non-stop for water fountains or a curb to stretch out my calves on. Sweat starts thickening and my ponytail is no longer dry, but the tip grazes my shoulder blades dripping with sweat. It's gross. I'm gross. My feet are huge, my calf is painful, and my hair is atrocious. All I want in life is to quit. My mind is yelling at me to do so, but those miles won't run themselves. Those miles will not run themselves. That is what I say when things get tough. They will still be there if I turn around and head home. No one else is going to run them for me. So you dig deep and that is when it all comes together. Your mind starts being kinder to itself and your muscles can do hard things. And finally it is done. Your fridge has an adult beverage, your pants can be pajamas, and you can freely talk about how bad*ss you feel for finishing. I had a long run like this on Saturday. It wasn't too far and it certainly wasn't too fast, but for the last hour it was so hard. I hated how my body was feeling, but mentally I felt strong. The miles ticked away and by the end of it I had convinced myself that I could finish this run, the next run, the upcoming half, and the upcoming full. Endorphins are a terrifying, powerful thing. Even after a dozen plus training seasons, my favorite part of the long run is how good you feel when it is done. I don't like skipping the social scene the night before and the too early wake up call in the AM, but I love knowing I just conquered X miles before most people woke up for the day. That is how I felt on Saturday. Until my sore legs saw my these sad puppy eyes on Sunday and I knew that a quick stretch out your legs/ tire the pup out jog after church would make everyone feel better. Cal did great (sans a poo break in the middle of the road) and my muscles thanked me for going slow on the day after. Sorry long run, Sunday's run was way better. 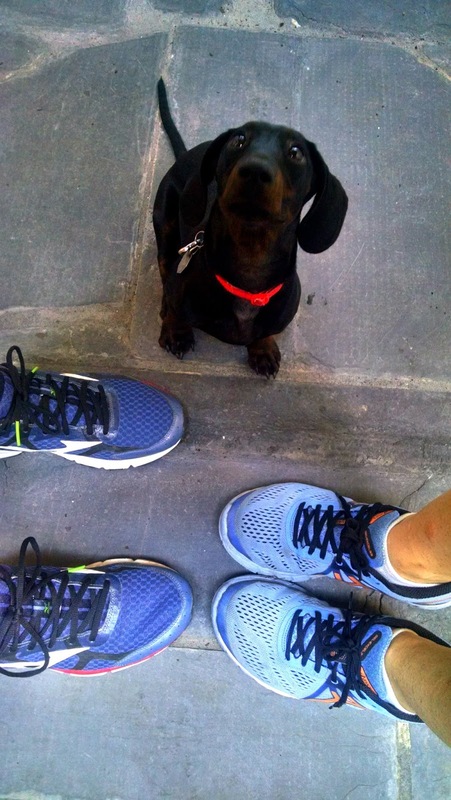 The family that runs together can stay on the couch and eat queso together, right? Wow. I feel so inspired now! You're making me want to train for another race and do long runs!! You are a great writer. I had a great long run. Way to go!!! Ugh, the dreaded long run! The only thing worse than actually running the long run is the guilt you feel when you talk yourself out of doing one... oops! so awesome. and your pup is so cute. i couldn't do my fav workout on saturday due to birthday party obligations so i worked extra hard on sunday! I'm in such awe of how you're doing this, look at you go! I barely trained for a 5K, and I'm so glad I did it but I can't imagine pushing my body to do more. You rock! These are all so true. It's crazy how much of a roller coaster long runs are. Getting through them (especially with the whole day ahead of you) is such a high!